A 26-year-old Bruce McLaren founded his new company, Bruce McLaren Motor Racing Ltd, in a small south London lock-up on September 2, 1963, and tragically, only seven years later, the Kiwi racing ace was killed testing one of his M8D Can-Am sportscars at the Goodwood circuit, in the south of England. Since McLaren’s death, the company he started has become a global household name in Formula 1 racing, with world champs Fittipaldi, Hunt, Lauda, Prost, Senna, Hakkinen and Hamilton winning titles with the team. As well, continuing success in sportscar, Can-Am and Indycar racing, plus an incredible run of exotic road cars, has positioned McLaren Automotive as a significant force in the broader automotive world. 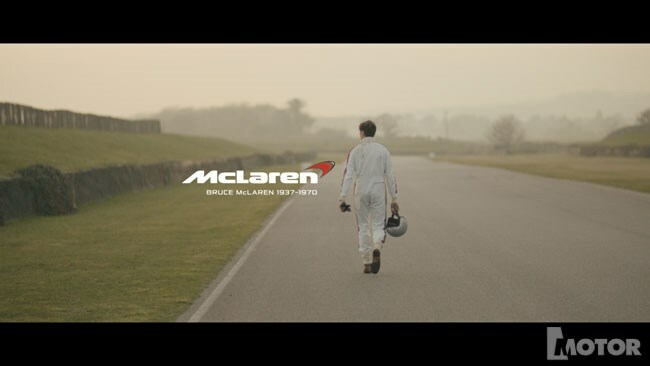 As part of its 50-year celebrations, McLaren has commissioned production of the three short films; part one of the heritage trilogy, directed by Swedish music-video maker Marcus Soderlund in his trademark, dreamlike style, following the ghost of Bruce McLaren as he retraces the scene of his Goodwood crash.